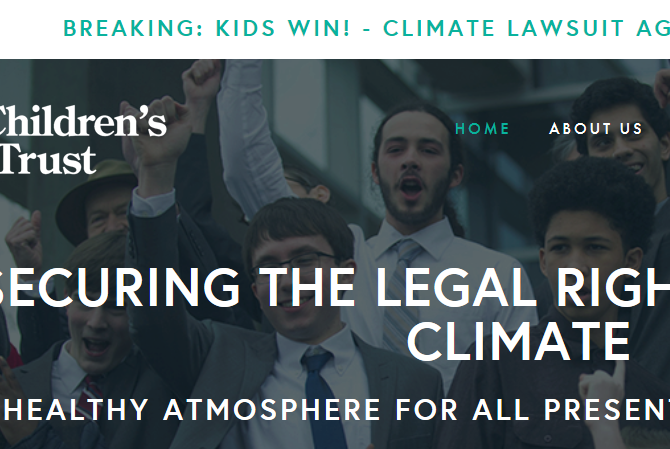 November 10, 2016, twenty-one youth from the United States, age 9 to 20, were legally permitted to file a landmark constitutional climate change lawsuit against the federal government in the U.S. District Court for the District of Oregon. With support from ‘Our Children’s Trust‘, the youth’s complaint asserts that, through the governments affirmative actions in causing climate change, it has violated the youngest generation’s constitutional rights to life, liberty, property, as well as failed to protect essential public trust resources. ‘Carbon Dioxide Information Analysis Center (CDIAC)‘, or simply Global Carbon Project, has published preliminary¹ national carbon emissions, from Fossil Fuels and cement, in 2015. The total national carbon emissions are converted to per capita carbon dioxide emissions (tons of CO2 Emissions) by multiplying by 3.664 and then divide by Population (sourced ‘World Bank‘). The table below shows the per capita CO2 Emissions from Fossil Fuels (without bunkers) and cement, in tons, in 2012, 2013, 2014 and 2015 of all 97 countries with Climate Debt in ClimatePositions, after the key indicator update (see the ‘Ranking‘). Updates of 199 countries are available in the menu ‘Calculation (Excel)‘. 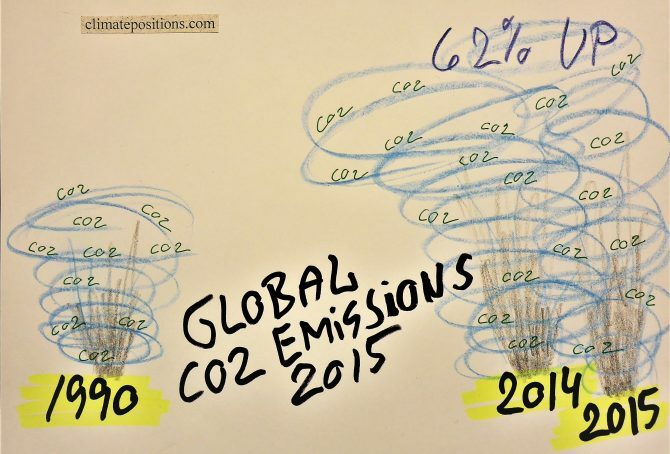 Note that emissions in 2014 and 2015 are preliminary estimates. The per capita Ecological Footprint¹ for 186 countries has been released for licensing by ‘Global Footprint Network’ (Public Data Package – Free Download). 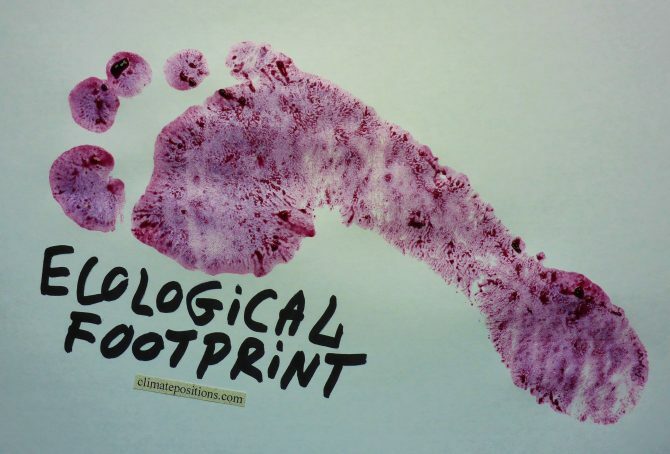 The total national Footprint without the weighty carbon Footprint² is used as an ‘Indicator’ in ClimatePositions. 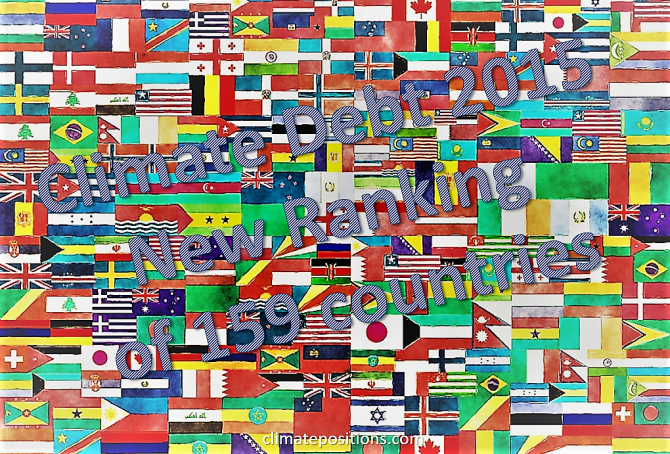 Now 15 additional small countries have full data and thus calculation of Climate Debt for the first time. The per capita Climate Debt of these countries are listed below. Brunei, Luxembourg and Equatorial Guinea enter top-ten of the worst performing countries among the previous 148 countries (see the ‘Ranking’ by January 2016).